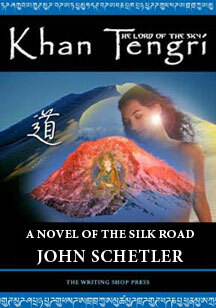 The Silk Road Series is comprised of the novels Taklamakan - The Land of No Return, by John Schettler, and its sequel Khan Tengri - The Lord of the Sky. This is epic historical fiction set in northwestern China in the year 757 A.D. It is the story of Tando Ghazi Khan, a simple caravaneer on the fabled Silk Road, who sets out from Dun Huang China on what he hopes will be his final trek to the western bazaars of Kashgar. But the mighty T’ang Empire of China has been shaken from within by the rebellion of the Turkic-Sogdian general An Lu Shan, and the balance of power in the Tarim Basin, where Tando must travel, suddenly shifts when the Chinese Western Garrisons are called home. Tando’s caravan is soon embroiled in political intrigue as the armies of Tibet, China’s long time rival, begin to advance into the Tarim Basin to choke off trade. Tando must use all his skills to secure the lives of his men and the safety of his cargo. He soon discovers an unexpected ally in the Tibetan camp and circumstances lead him to pursue the mystery inscribed on a strange map that will lead to an ancient secret in the heart of the most forbidding and feared desert on earth--the Taklamakan. eBook Vol I - Part one of the original epic novel Taklamakan - Author’s Intro, 40 Chapters - 346 pages or 149,000 words. eBook Vol II - The story continues with “Khan Tengri - The Lord Of The Sky,” which is actually a special edition release comprised of material from Taklamakan Part II and a new 7 chapter, 30,000 word addition. 40 Chapters, 396 Pages or 175,000 words. It’s a bit of “Shogun” and “Lord of the Rings” rolled into one! If you like detailed historical novels like James Clavell's Shogun, or epic tales such as Lord of the Rings by J.R.R. 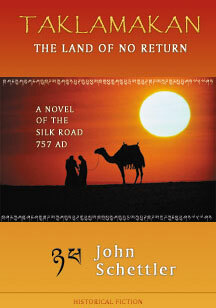 Tolkien, then John Schettler’s Taklamakan is a book for you. The original novel was published in a single volume containing two books in the year 2001 and it has since been expanded and released as it was originally conceived, in two volumes under separate titles. (Volume II is now called Khan Tengri). With the addition of seven new chapters, the two volumes now comprise an epic story of over 750 pages and well beyond 320,000 words in length. It's one of those tales where you get 150 pages in and you look ahead, excited to think that you still have 600 pages left! And in this case, the journey is well worth your time, as the story deepens and gains texture and drama as it moves along the desolate desert road. You will soon come to feel like one of Tando’s porters, riding the camel’s back into unknown adventure and a destiny that you could never have imagined at the beginning of the tale. Like any good teaser the back cover copy here sums up the story very well: “It was one of those moments on the cusp of time, when Tando Ghazi Khan, a simple trader of tea and spice leads a caravan to the edge of the great desert, and becomes embroiled in the struggle that will decide the fate of an empire and shake all under heaven and earth…” Yet this is a back cover blurb that delivers everything it promises in this amazing novel. The story follows the journey of a small caravan on the Silk Road, led by a worrisome yet amiable man named Tando Ghazi Khan. He's moving west out of the great central trading regions of China, hoping to carry one last haul of precious Jade Ring Green tea to the markets at Kashgar and make a healthy profit to retire on. Unfortunately for him, events in China are far from secure, which is one reason why he has chosen to head west early with this crop. The An Lu Shan rebellion has thrown the capital city Chang’an into chaos, and forced a recall of all the main garrisons along the vast desert lands to the west that Tando must traverse. At this critical time, the armies of Tibet have moved into this void, pushing over the high mountains to the south, intent on choking off trade all along the Silk Road. Tando has a fateful encounter with these forces when his caravan is caught up in the ensuing campaign. All the elements of a great novel are here, detailed and well textured setting that is steeped in meticulous historical research, a narrative style that handles the internal musing of the characters much like Clavell’s well read historical novels, yet with even more descriptive prowess when the author paints upon his expansive canvas, spinning out his multi-layered plot. The characters change and grow on you as the story unfolds, until you come to feel you have known them all your life, old friends that you hate to part with in the end. It’s the kind of a book you can lose yourself in entirely, an exotic adventure that is almost cinematic at times while avoiding all of Hollywood’s foibles and old props. Yes, there are chase scenes, and battles, and scheming intrigue, but they are handled with the skill of a master story teller here, essential to the flow of the evolving plot lines, and not merely gratuitous literary artifice to compel you to turn pages. As all movement west from China must eventually confront the desolation of the Taklamakan desert, Tando’s first decision is whether to go north or south of that imposing obstacle. When one of the caravan’s scouts returns with the news that a large armed party of Tibetan raiders has come down from the Himalayas, this decision is given much more urgency. Eventually the caravan runs afoul of an enterprising young Tibetan general, and this early antagonist soon becomes one of the major protagonists of the story, in an artful twist that sees Tando and his men becoming instrumental to the general’s campaign against the Chinese Tang Dynasty. A seeming subplot of the novel involves secret confounding map that Tando has kept well hidden, but loses as he flees west. It falls into the hands of the Tibetans, and when Tando's caravan is overtaken, he signs on as a porter supporting the Tibetan column in the hopes of recovering his cherished map. He and his men soon become embroiled in the internal squabble between warring Tibetan factions within the army. Yet, as the column moves slowly west, Tando has his eye on a secret sanctuary hidden in the heart of the Taklamakan desert. It becomes a place of refuge as well as a moment of sublime destiny for him and for other characters in the story as well. The clash of cultures, on both a political and religious level, is a big element of this story, as the novel takes place at a time when Tibetan Buddhism was only just beginning its migration from India into the lands beyond the Himalayas. Thus part of the story involves the conflict between the ancient Tibetan Bon religion and the emerging tenets of Buddhism. These segments of the novel, where Tibetan clan leaders oppose and clash with one another, could have been written by James Clavell himself! They are that good. Yet beneath this political struggle, the individual hopes, desires, dreams and discoveries of the characters on the journey are the essence of the novel. Each of the major characters finds more than he bargained for on the long desert road, and some of the descriptions of their internal epiphanies are absolutely sublime. • Jade Ring Green, a tea of great virtue, becomes a saving grace for Tando and his men. • Forbidden rites ignite the passion and contention of rival clan leaders. • A young Tibetan general struggles for survival when treachery and betrayal threaten his mission. • A lost waif is led to a hidden shrines and the long guarded secrets of the Tantra. • A Tarim scout pursues an emerging love and is driven to a fateful moment at a forsaken desert outpost. 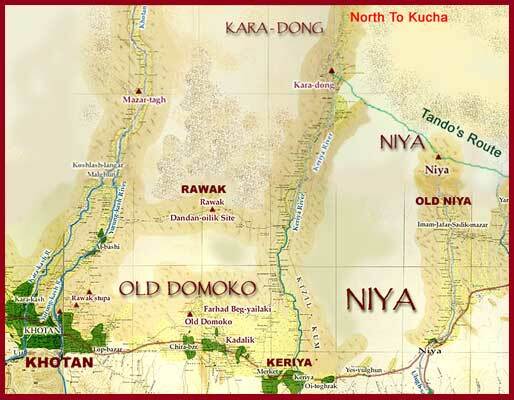 • A trader's map reveals a secret that leads to the heart of the mystery in the Taklamakan. • The deepest truths of Buddhism are revealed in a moment of great awakening.